Tree Pruning Portland | Mr. Tree, Inc.
Tree Pruning is essential to ensure a tree’s overall health and to keep it producing effectively, especially in Portland’s ever-shifting weather. In the case of fruit trees, pruning must be done to maintain the structural integrity and to help it yield more fruit each season. 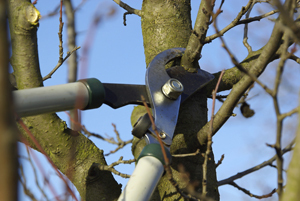 For other types of trees, pruning can help in a variety of ways. No matter what the reason, Mr. Tree, Inc. has a team of arborists that will be able to effectively and safely prune your trees to maintain their health, and give them a more pleasing look to your landscaping. Pruning a tree affects its appearance and health. A tree that is well-positioned and well-maintained can remain healthy and strong for many years. Inappropriate care can drastically reduce the lifespan of a tree. It is essential that you choose a knowledgeable professional to help you throughout the process. Hire trained, experienced and reputable professionals, as tree pruning is not as easy of a task as it may look. Do a search for ‘tree work accidents’ on the Internet to get an idea of what could tragically go wrong. A reputable tree pruning service will be licensed and insured, and they will not hesitate to show you documents such as proof of liability for damage. Be sure to check that the company’s insurance policy is current and valid. You do not want to be responsible if a worker gets hurt, or if a neighbor’s property is damaged while work is being performed. Ensure that the arborist is certified or is a member of a reputable institution. This confirms a certain level of commitment within the industry and gives you reassurance the arborist possesses some degree of knowledge. It also ensures that he is working for a legitimate tree pruning company and has the license to do so. Inquire about and understand the safety procedures followed by the tree company. Do not give the job to any person who shows up with a ladder and a chainsaw. The workmen should be wearing specially designed safety gear, like face shields; and should be using latest climbing gear, like climbing ropes and saddles. Ask for client references. Contact the company’s existing/past customers and find out if they were happy and satisfied with the quality of work performed. You can also take a look at their latest work and ongoing projects. Get at least three cost estimates. Pruning can be an expensive task, especially the larger the tree is. Compare estimates and ask questions. Different pricing is often attributed to various ways of calculating; beware of hidden costs. Also, insist on getting the estimate written down on paper. Stay away from companies that insist on full payments upfront. A home improvement contractor may ask for full payment, but there is absolutely no reason why a tree service company should do the same. Make sure you are satisfied with the job performed before releasing the full payment. A tree takes a long time to grow fully, yet can be permanently disfigured in moments. It is important to select experienced and skilled tree service professionals. Get an Tree Pruning Quote Today! We hope to see you soon! in the meantime please fill out the form provided and a representative will get back to you as soon as possible. If you would like to speak to a representative by phone, please call (503) 665-3917 ! We are open 365 days a year, and offer NO ADDITIONAL COSTS FOR HOLIDAY AND WEEKEND WORK!